Composite mega columns of tall buildings are currently designed with continuous built-up sections, welded in the fabrication shop and spliced on the job site without any prequalified welding procedure. This leads to highly restrained welds and splices which, under severe dynamic loadings, will likely crack before exhibiting any ductile behavior. These tall buildings have not been submitted to severe earthquakes, but it will happen. The 1994 earthquake in Northridge, California, taught us that welding procedures, beam-to-column connections and column splices have to be as simple as possible to properly and reliably work as anticipated. Using multiple rolled sections encased into concrete is the solution for increasing the safety of tall buildings. It leads to less welding, less fabrication works and reliable simple splices which have been used for decades in high-rise projects. 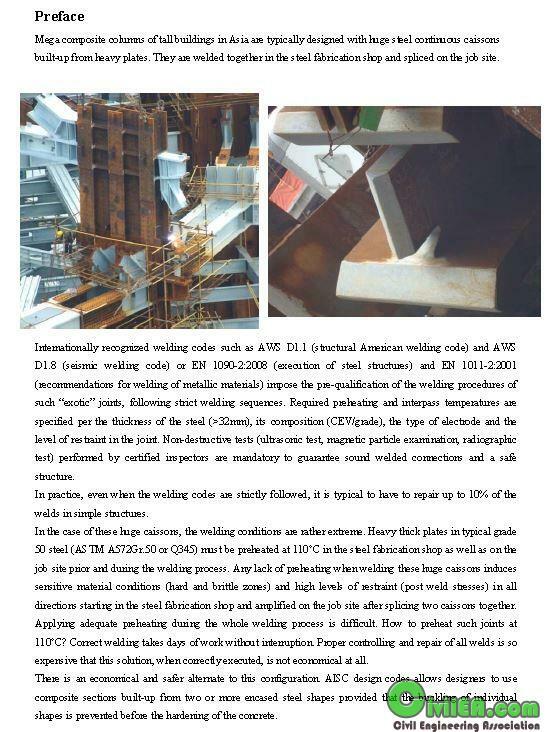 AISC allows engineers to design composite sections built-up from two or more encased steel. But, it doesn’t explain how to perform and check the design. This paper offers a method to do it. The method is explained by means of design examples covering combined axial compression, bending and shear.